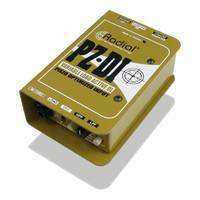 The Radial PZ-DI direct box is a high quality phantom powered active DI from the worlds leading manufacturer of DI's. 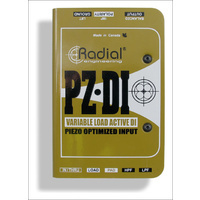 The Radial PZ-DI direct box is a high quality phantom powered active DI from the worlds leading manufacturer of DI's. This model is one of the most complete Radial DI's yet, with high and low pass filters, a variable impedance selector, an attenuation pad, polarity and ground switches, and a piezo microphone optimised input catering for acoustic and orchestral instruments. 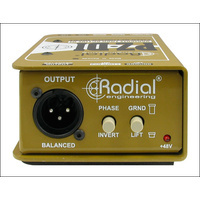 The most outstanding feature of the Radial PZ-DI is the selectable 3 position load adjustment switch that allows the user to choose the most appropriate impedance when using either a microphone or pick up. 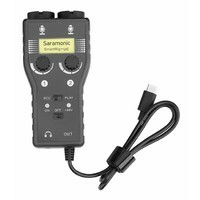 Different load settings will nominally change the tone and level of signal being picked up by the microphone or pick up attached to the instrument. 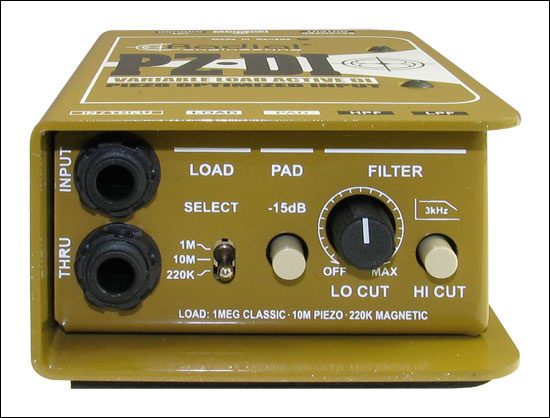 For example, using the 220kΩ for an instrument with a magnetic pick up will "warm" the tone, whilst the 10MΩ will help to eliminate the squawky boxy tone picked up by piezo microphones internally placed within the instruments. 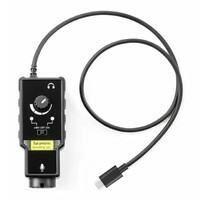 The 1MΩ offers the most natural selection without applying any excess load. 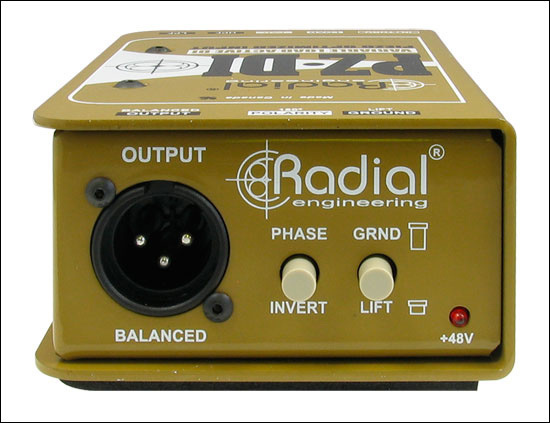 The Radial PZ-DI is ideal for use with cellos, acoustic guitars, fiddles, mandolins, violins, bass guitars, and most orchestral type instruments. 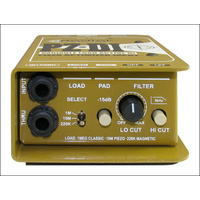 With the variable low cut filter, the amount of low end resonance captured by microphone or pick up can be altered in accordance with the type of instrument, whilst engaging the high cut button will roll off high frequencies from 3kHz and above. 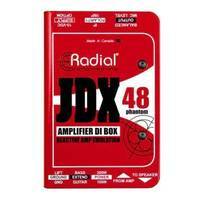 It is ideal for smoothing out the peaks and providing a natural amplified tone of the acoustic instrument without false colouration. As per most Radial DI's, the PZ-DI includes a ground lift switch for eliminating any hum caused by intermittent signal earthing loops. 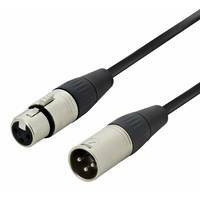 The polarity switch enables the inversion of phase when required whilst the attenuation pad will guard against overloading the DI with signal, thus avoiding any chance of distortion and permitting crystal clear signal to pass. 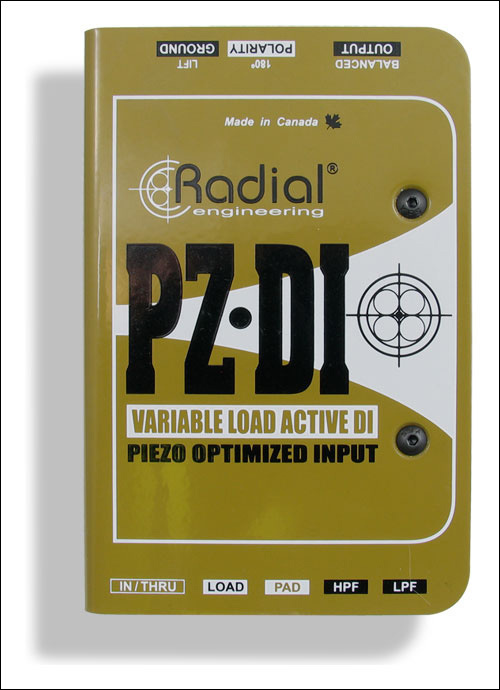 The PZ-DI is constructed from 14 gauge steel in Radial's unique book end design, that ensures added protection around all the switches and connectors. 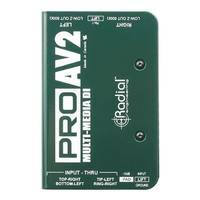 An internal beam supports the internal PC board, taking any additional pressure off the important internal components. 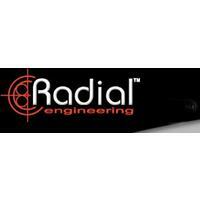 The rubber provides extra isolation from vibration and protection from wear and tear.